We put at your disposal a large fleet of vehicles, with recent models, comfortable and safe. All our Cancun Airport Transportation services have current insurance coverage. We know that it is important for you to get to your destination without any problems; for this reason, our main objective is to ensure that you have your Cancun airport transportation in advance so you don't have to worry. We know the value of your time and your comfort is a priority. Booking your private transfer, you won't have to look for a taxi or bus. Our staff will be waiting for you to provide the Cancun airport transportation. Welcome to Cancun. Enjoy your stay to the fullest. You can book your Cancun Airport transportation in a few minutes and ensure the best service that will take you to your hotel in various points of the Riviera Maya. Our reservation system is 100% secure and reliable. We offer the best transfers at Cancun airport. Welcome to Cancun International Airport's Ground Transportation Center! Choosing Limousines for your Cancun Airport Transportation or your Luxury Chauffeured Service is a great way to discover Cancun city and Riviera Maya, enjoy your Cancun Transportation to hotel. We provide reliable Limousine Services in Cancun, Taxi or Shuttle service either with Toyota Tundra Limo and Sienna Limo or with Luxury Suvs. Our bilingual chaffeur provide the appropriate Limousine Shuttle Service while you are in Cancun. Once you will have gone through the Airports custom check, your bilingual driver will welcome you personally, will assist you with your luggage and will drive you to your destination, in the best and safest way. We also provide the Cancun Airport Transfer Service with bilingual chaffeur, sightseeing and tours with either an Luxury Limo or a Van as from 2 hours. Why book a Cancun airport transportation service? Feraltar provides comfortable Cancun Airport Transportation. When you book any of our services with us, you can be sure that we will be at the Cancun airport to take you to your hotel or to the place you indicate. How can I book my Cancun airport transportation? To book our services is very easy. You can guarantee your Cancun Airport Transportation through our website or by phone; in both ways, we will attend you in a friendly manner and help you to ensure your service. How far in advance should I book my Cancun Airport Transportation? You can ensure your Cancun Airport Transportation by booking up to one day in advance. This way you will be guaranteed that our staff will wait so that we can support you by taking you to your hotel or to the destination you have chosen. Feraltar will give you the best service. What services does Cancun Airport Transportation offer? Airport to Hotel, where we will wait for your arrival at the air terminal to provide your transportation at Cancun Airport. Hotel to Airport, where we will pick you up at the hotel to take you to the airport. Round Trip, which is the most complete service because we take you from the airport to the hotel and from the hotel to the airport. We can also take you to various tourist attractions starting from two hours of travel time. What type of vehicle can I choose for my Cancun Airport Transportation? If you need a low-cost service, we can provide you with a van for ten people that will take you comfortably to your hotel. Our private Cancun airport transportation service can take you to different points of the Riviera Maya; also, the VIP service. Both are available 24 hours a day. s it comfortable to use a Cancun Airport Transportation service? The service is the most comfortable; our luxury vehicles provide the best experience for you. We offer a bilingual driver who will be waiting for you at the airport. He or she will also help you with your luggage and guide you to the vehicle so that you arrive at your hotel without worries. We always make sure you get the best experience in your Cancun Airport Transportation. Can I change my reservation schedule? We understand that there are situations where you make changes to your travel plans. We can come at a different time than your reservation; you just need to tell us, one day before, that you will change your arrival time and we will make sure to help you with your Cancun Airport Transportation. What is the payment method to book a Cancun Airport Transfer? To book your Cancun airport transportation, we make our website available to you. You will be able to pay for your reservation by credit card through PayPal. I want to cancel my Cancun Airport Transportation. What do I do? There are circumstances when, for various reasons, you need to cancel your Cancun Airport transfer reservation. In Feraltar we understand this and therefore, we give you the facility to cancel your service up to one day in advance. Does my Cancun Airport Transportation include a bilingual driver? In Feraltar we have bilingual drivers so that you do not have communication problems during your Cancun Airport transportation and enjoy your transfer to the maximum. What advantages does the Cancun Airport Transportation by Feraltar offer me? With Feraltar you will have the advantage of enjoying the maximum security and the best quality in service of Cancun Airport Transportation since from the moment of your arrival, we will be waiting for you so that you do not have to worry about looking for a taxi or bus service to reach your destination. Do you provide with baby seats on your Cancun Airport Transportation or Tours? What makes my Cancun Airport transportation be safe? In Feraltar we know how important is the safety of all members of your family, that's why we have baby seats for even the smallest traveling in the safest way. Can I take my pet with me in Cancun Airport Transportation? At Feraltar we are pet-friendly so all family members can travel with us. If you take your pet you can take it with us as long as they are inside a pet cage. What is the private transportation service? In the Private Transport, you will be able to transport in a new vehicle with air conditioning. It is a low-cost private service with a capacity of up to 7 passengers. The VAN can transport up to 7 passengers. This private service is available 24 hours a day and is a direct service with no additional stops. What is the most comfortable type of Cancun Airport transportation available? The most comfortable service in Feraltar is VIP transportation. In this service, you will be on board in one of our luxurious Chevrolet Suburbans, leather interiors, DVD and A/A. 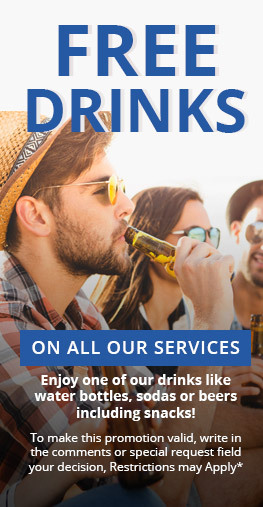 This service also includes water bottles for you to travel in the most pleasant way. The Chevrolet Suburbans have a capacity limited to five passengers, so if you travel in a small group and want to get to your destination in a more comfortable way this is undoubtedly your best option. Can I reserve Cancun airport transfer for special occasions? We know that beaches and beautiful landscapes are ideal for parties, weddings and special events, so we put at your disposal limousines and luxury cars for you to have a luxury experience. What Cancun Airport transfers services are available 24 hours a day? I have more questions about my Cancun Airport Transportation; how can I contact you? If you need a personalized Cancun Transportation service, and can't find it on our website, please contact us by our Contact Form or call us at USA/CAN Toll Free: 1-888-644-7803, Toll Free Mexico: 01 -800-837-1358 and from the rest of the world: +52 (998) 295 0457 or by our online chat and one of our travel agents will assist you and will answer all your questions about our transfers services. Copyright © 2017 - Transportes Turisticos Feraltar S.A de C.V.. All Rights Reserved.